BEIJING/SEOUL—North Korean leader Kim Jong Un visited China and met Chinese leader Xi Jinping, state media of both countries said on May 8, their second encounter in two months in a flurry of diplomatic engagement that has eased tensions on the Korean peninsula. They met on May 7 and 8 in the coastal city of Dalian ahead of what would be a historic meeting between Kim and U.S. President Donald Trump that the White House has said could take place as soon as this month. China has been keen to show it has an indispensable role in seeking a lasting solution to tension over North Korea’s pursuit of nuclear weapons— concerned that its interests may be ignored, especially as North Korea and the United States establish contacts. During the visit, announced only after it was over, Kim told Xi he hoped relevant parties would take “phased” and “synchronized” measures to realize denuclearization and lasting peace on the Korean peninsula. 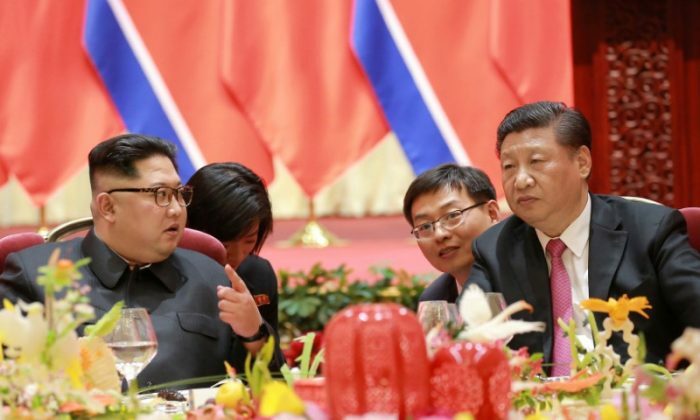 “So long as relevant parties eliminate hostile policies and security threats towards North Korea, North Korea has no need for nuclear (capacity), and denuclearization can be realized,” China’s state-run media Xinhua cited Kim as saying. Trump and Xi discussed developments on the Korean peninsula and Kim’s visit to China during a phone call on the morning of May 8, the White House said. Trump and Xi agreed on the importance of maintaining sanctions on Pyongyang until it permanently dismantles its nuclear and missile programs, the White House said. Chinese state media said Xi reiterated China’s support for a U.S.-North Korea summit. In the past, North Korea has used the term “hostile policies” in reference to the U.S. troop presence in South Korea, the U.S. nuclear umbrella covering South Korea and Japan, and regular joint military exercises in South Korea. China is North Korea’s most important economic and diplomatic backer, but Beijing has been irked by Pyongyang’s repeated nuclear and missile tests and supported tough U.N. sanctions against its Cold War-era ally. The two sides have stepped up engagement since Trump surprised the world in March by saying he would be willing to meet Kim in a bid to resolve the crisis over Pyongyang’s development of nuclear missiles capable of hitting the United States. Kim was accompanied to China by his sister, Kim Yo Jong, who has played a leading role in diplomatic overtures by the long-isolated country. Chinese state media showed pictures of Kim smiling in an outdoors meeting with Xi, and the two leaders strolling along a waterfront. Xi also hosted a banquet for the North Korean leader. 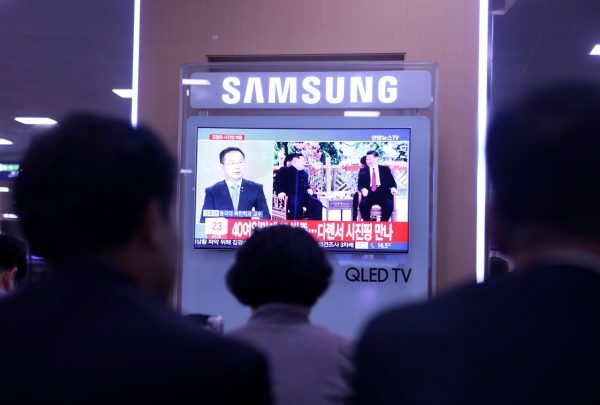 North Korean state media said Kim was “very pleased” that the relationship with China was reaching a high point, and North Korea would cooperate with China more actively as the situation on the Korean peninsula changed. The meeting was the latest in a series by North Korean leaders and follows Kim’s historic summit with South Korean President Moon Jae-in last month. In March, Kim travelled by train to Beijing, his first known trip abroad since assuming power in 2011. Kim used his official aircraft to make the short flight to Dalian, in what was his first known international flight since assuming power. Kim’s father, Kim Jong Il, feared flying, fuelling speculation that the younger Kim may not be willing to travel far to meet Trump. The venue for their summit has not been announced. The demilitarized zone, or DMZ, between North and South Korea, and Singapore are believed to be the most likely contenders for the venue. South Korea’s presidential office said the Chinese regime notified Seoul about the Xi-Kim meeting in advance. Intense secrecy typically surrounds high-level North Korean visits to China, and this week’s trip was no different. Throughout the day on May 8 there was speculation on Chinese websites that a North Korean leader was in China, though China’s foreign ministry said earlier that it had no information and Chinese state media did not carry any reports. Japanese public broadcaster NHK had shown images of two North Korean aircraft taxiing at Dalian’s airport, one an Air Koryo (North Korea’s state-owned airline) plane and another carrying a North Korean emblem. Posts about unusual traffic jams and security in Dalian popped up on Chinese social media.